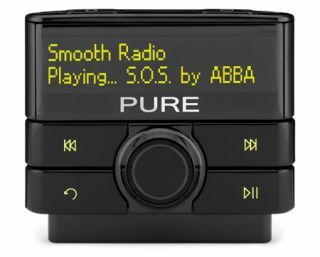 Pure launches Highway 300Di in-car DAB radio with free installation | What Hi-Fi? Digital radio specialist Pure has teamed up with Halfords to offer free installation of its new Highway 300Di in-car DAB radio. The offer runs until the end of 2011, so the customer only has to pay the retail price of the unit – £180 – with no installation charge. After that, Halfords will charge a minimum £25 installition fee – and more if the customer requires mobile fitting, extra cables or a third-party bracket. Pure says in-car DAB radio is its next big growth area, and the Highway 300Di is designed for professional installation rather then the original DIY Highway unit which has been on sale for three years. There are three key parts to the 300Di system: the control unit which goes on the dashboard (top and bottom pictures), the main box of electronics which can be hidden away elsewhere in the car, and a two-part powered DAB aerial (above). One part of the aerial fits externally to the top of the windscreen, the other part inside the car. Almost any car can be fitted with the unit, although those with a soft-top or fibreglass or aluminium shell will need an alternative, internal windscreen mounted aerial. Additional features include dual tuners, line out, aux in, USB socket plus DAB/DAB+/DMBR and L-band compatibility. The device is 'Made for iPod/iPhone" compatible so you can connect your iDevice and use the controller to search/play music while it charges too. It's also compatible with USB devices such as a flash drive, or mobile phones/MP3 players with a USB connection. Users can pause and rewind live radio – handy if you stop off at the petrol station to fill up during one of your favourite programmes – and there's even a 'picnic mode' which lets you listen to the radio with the ignition off and the car keys removed. Asked about intermittent DAB reception while travelling around the UK, and the problem of signal dropout, Pure says the powered antenna should give much more robust performance while on the move. It also points out that the BBC is expanding UK DAB coverage from 93% now to 97% in 2015, with particular emphasis on the UK's road network.